Last night, for this year’s Tusk Conservation Lecture, Michael Keigwin of UCF and Charles Tumwesigye of UWA gave an uplifting and inspirational account of how they have reversed the fortunes of the park, to a packed audience at London’s Royal Geographical Society. 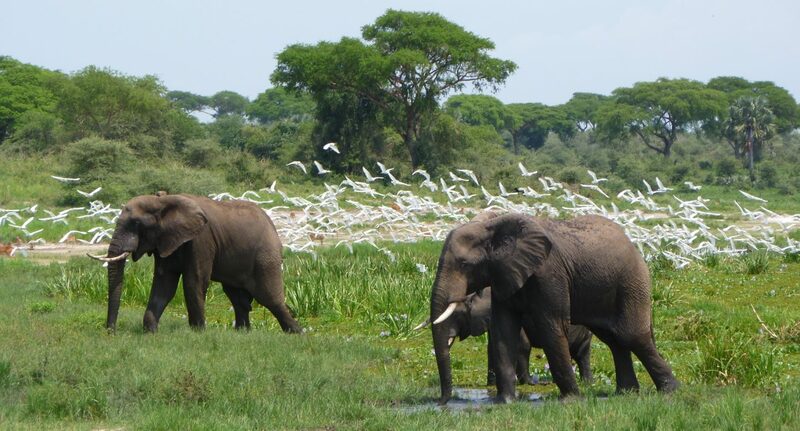 Murchison Falls National Park was established in 1952, and through the 50’s and 60’s it was the most popular wildlife tourism destination in East Africa, attracting tourists from all over the world. It was one of the key locations in the filming of The African Queen. Sadly, civil unrest in the 70’s and 80’s and the collapse of tourism saw the park fall into the hands of armed insurgencies – with the Lord’s Resistance Army controlling ⅓ of the park – and there was poaching with impunity. The wildlife was decimated, with the elephant population falling from 14,000 to 200. That was the situation until five years ago, when the Uganda Wildlife Authority and Uganda Conservation Foundation began tackling problem after problem. With the support of Tusk and others they have rapidly reversed the park’s fortunes, restoring it to its former glory. The construction of 14 new ranger posts, both along the waterways and within the park (rather than just on the periphery), together with marine patrols along the Nile and the introduction of standard operating procedures, have produced a far more effective and motivated ranger force. More than twenty tonnes of traps have been destroyed in five years, and the local poacher economy has been undermined. The capacity of the UWA legal team has been greatly enhanced – in part with funding from the UK Government through the IWT Challenge Fund – and the prosecution rate for poachers has soared to 95%. UWA and UCF also support the local communities around the park by preventing elephants eating and destroying crops, by digging trenches to act as barriers or through the actions of community scouts. The recruitment and training of 50 of the community scouts has been made possible through the IWT Challenge Fund programme. This Tusk-UCF programme is also supporting the communities with the development of food gardens as an extra boost to the local economy and to further remove incentives for poaching, as part of phase 2 of the park’s recovery. The results are highly impressive! The doubling of the park’s herbivores includes a doubling of the endangered Rothschild’s giraffe – for which Murchison is one of their greatest strongholds – with a population now of over 1,500. Tourism is growing annually by 15%, and the park will soon receive 100,000 visitors every year. With 20% of the tourism revenue being shared with community districts, UWA is able to guarantee a minimum of $300,000 per annum to community development across the region, doing wonders for community-park relations. Michael and Charles demonstrated what can be achieved through grit and determination, both their own and that of their very committed teams. Their work is an incredibly positive model of how government agencies and NGOs can achieve great things through working in partnership, and we look forward to further updates as they go from strength to strength. Tusk is extremely grateful to Artemis Investment Management for again sponsoring the Tusk Conservation Lecture, and we also thank Volcanoes Safaris for providing an incredible trip to visit Uganda in the silent auction, and Painted Wolf Wines for supplying the drinks at the reception.